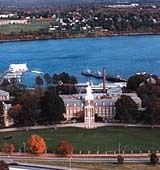 Located halfway between New York and Boston in New London, CT, the United States Coast Guard Academy (the smallest of the five service academies) provides a physically, personally, and academically rigorous education. The 1000 or so cadets here study programs including engineering and management, and their professors are among the few who can claim to have busted drug smugglers. Candidates must go through the rigorous multi-step admissions process. The U.S. Coast Guard Academy is proud to educate leaders of a multi-mission, maritime military force. As a commissioned officer in the Coast Guard, you will be leading a team of men and women who are continually called on to serve their community, country and fellow citizens. At our beautiful campus on the Thames River in New London, Connecticut, the Academy provides a four-year Bachelor of Science degree program with a full scholarship for each individual. Each year, approximately 200 ensigns (or junior officers) are commissioned during graduation exercises in May. Following graduation, newly commissioned ensigns report for duty aboard cutters and at sector offices in ports nationwide. Graduates of the academy are obligated to serve five years in the U.S. Coast Guard, though many choose to stay and make a rewarding, life-long career of their maritime military service. 47% of students graduated in the top tenth of their class. United States Coast Guard Academy participates in the NCAA Division III for college athletics. Want more info about United States Coast Guard Academy? Get free advice from education experts and Noodle community members. I am looking for information on the football team and if you offer football camps over the summer? To learn more about football at the United States Coast Guard Academy, visit the school's athletics page.